I love how my semi-secret holiday sewing turned out. 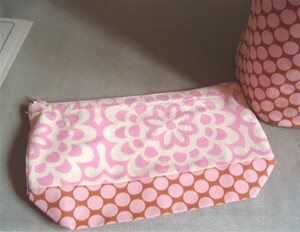 The lining is the pink and white lotus fabric that I'm crazy in love with. I love that this bag stands up on it's own and doesn't look like total crap. With me behind the sewing machine, there's always a chance of that, ya know. I loved Nora's post from yesterday. I think it was yesterday. Time is a blur when you live in jammies, people. I love how Nora makes time for herself daily. That's something that I think is hard for women to do because we have so many responsibilities resting at our feet. I'm going to work on a version of this in the coming year. Don't hold your breath, btw. We know how my plans work out. I love that what's his name is working on the whole thoughtful man thingy. It's still freakin' me out, but I kind of like it. Just don't tell him that. Maybe one day, I'll be comfy with it. Yes, I know that the minute I'm comfy with it, he will stop. Believe me. I know. While I do not love how my second zipper went in, I do love how this little bag turned out. 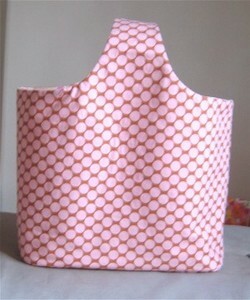 That's the lotus fabric I used for the lining of the other bag for those who haven't been playing along. I love that Amy Butler and her fabric. I used the zipper foot and things did not go as smoothly as they did without the foot. I would love to be good at the whole zipper magic thing. It's on the list for the new year. Trust me. & I love ya'll for wandering in and sticking with me through the weirdness, cat pictures, half a million socks and all that crankiness. While I would have a hard time explaining the friendships, support and love that's come from this blog to someone who doesn't blog publicly, we know it's here and I think that's what matters. Yarn: Rowan's Kidsilk Haze. Colorway is Grace or # 580. Mods: I knit the st st version, but used the beading from the garter stitch version. I did not count repeats and added the beads on each chart repeat. Don't hate me, Romi! I like how it looks with more beads and the beads helped me to make sure I was following the chart the right way. I had some gauge issues and regret using the US 5 tips as the pattern calls for. Having a big head is hell. Plus I've got the round face, so I knew going in there would be issues down the road. Boy, was I right! I ended up having to use a US 12 tip to cast off on the edge that is around my face. The T3 stitch was tighter than it should be and caused my cast off issues. I skipped the picot edge cast off because of those gauge issues. 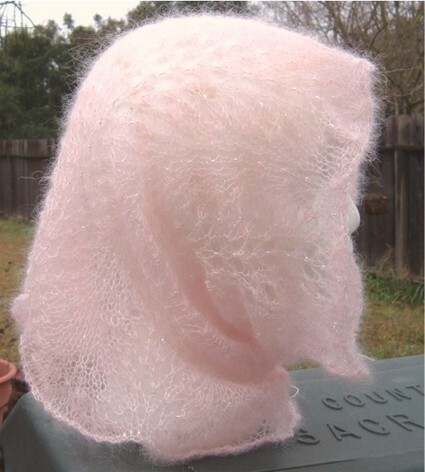 My Beverly sent me the kidsilk haze, which I love far more than I should love anything, and some pink seed beads. Isn't she fab and lovely?! Yes, she is. Thanks again, Bev! Speaking of Beads: My US 12 crochet hook (think tiny, people) would not fit through the pink seed beads. I looked in my bead kit and found some tigertail wire and tried to make it work, but the pink beads hated me and, after a couple of hours, the feeling was mutual. I will use them for something else, even if it kills me. Enter the opaque beads. I liked how they looked with the pale pink yarn and they were slightly larger than the tiny pink beads. I was able to get them onto my bent piece of tigertail and off the wire and onto the yarn, so I was in business. 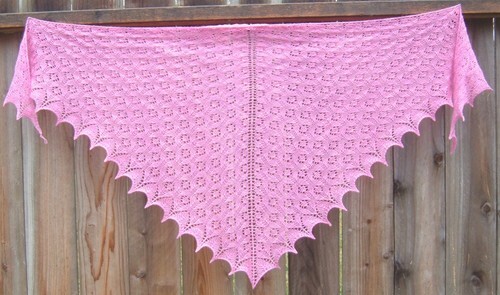 Blocking: What could be easier than laying out damp lace, pushing it into shape and walking away? I loved seeing how the scallops really took shape as I worked with the lace. If you don't like waiting for your projects to dry, this may be the pattern for you. My next one will be longer because I think I'll feel more comfy that way, but I need a thinner face before that will happen. Round faces may be a little disappointed when looking in the mirror with this one. (or is that just me? don't answer that!) Much better on chickies with great cheekbones. I love that I was able to mix and match this pattern and get something that was unique to me. I think the clear beads with their slight color to them really suits the yarn without over powering the pale pink. This was my first time using Kidsilk Haze and I can't wait to use it again. 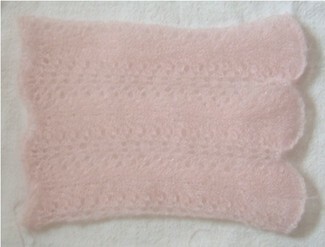 For me, Ice Queen was the perfect pattern to try mohair with because of how simple and easy the pattern is to knit. That simplicity allowed me to spend more time figuring out the yarn. I'm not sure I would have done so well with the knitting if the pattern and yarn both required my full attention. 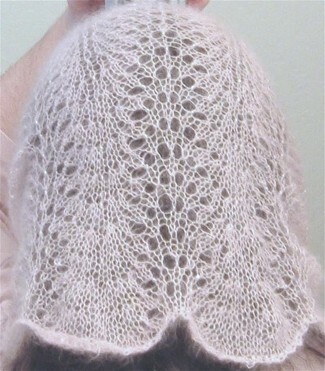 Normally, when I knit lace, the pattern gets most of my attention because I'm used to working with lace weight yarn. This was a nice change for me. Oh, and I did not do the Russian Join because I couldn't see the plies of the yarn. Yes, I had my glasses on and they were clean. I don't think my lack of a Russian Join takes away from the piece. Although, I am disappointed that I wasn't able to give that method a try. Maybe next time. One concern I had while knitting was how the color of the yarn was going to show the pattern of the lace. Since I have dark hair, I didn't need to worry. The lace is shown well against my bottle brown hair. Even when the hair is a bit messy. Shut up! It's a really long weekend over here and the cat doesn't care how I look as long as I get my cat chores done on time. In this last photo, you can also see what I mean about feeling like that edge curled a bit. I need to figure out what I did wrong there at some point. You can also see why my next one will be longer. Who knew I'd need a longer one when I've got a short neck? Hush up! Tomorrow, end of the year love and some cat hair because everything is better with cat hair. Sky can be seen in the top left corner. Look hard. You'll see it. 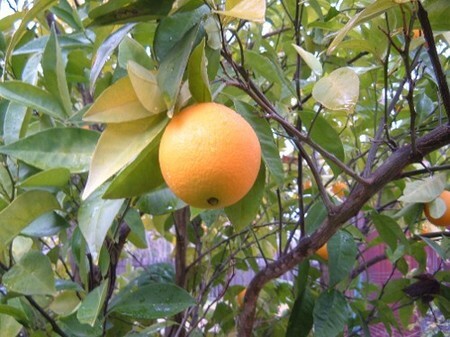 Anyone want to come over and pick oranges while standing in a puddle in a drizzle? Happy & Safe Saturday, ya'll! Size: Six feet across the top and thirty-two inches down the spine. Not bad, right? Time Served: Restart: 12/21/07 Finished: 12/25/07 Yeah, I hate me, too. I knit sixteen repeats of the second chart this time around. (The first time, I knit nineteen and ran out of yarn during the cast off.) I had a little yarn left over, but I'm okay with that. The yarn did not mind being frogged and reused. It was just as fun the second time around as the first. More so as there was no wondering over yarnage. I would have knit another repeat of the second chart and been okay yarnage-wise, but I was feeling like the shawl was done. Ya know? This is another of Evelyn A. Clark's patterns that I love. It was simple and easy enough without being boring. I love the option to make a shawl as big as I like and still know the edging will fit without me doing math. Now I want to do one with beads. Since the lace isn't dry yet, today we have cute fabric. 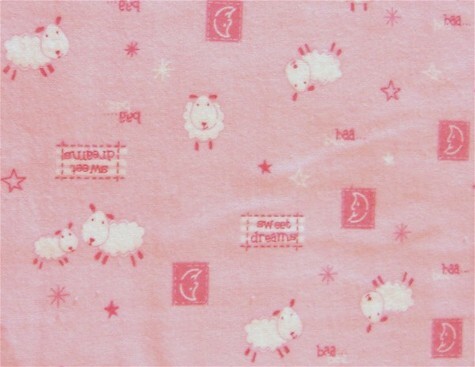 I'm thinking jammie pants, but that might be because that's all I've been wearing for a few days now. That is not a bad thing, btw. Getting dressed when you don't have to go anywhere and no one is going to see you* is highly over rated. The fabric came from Joann Crafts. It's an exclusive (flannel) fabric to them. It's not fabulous quality, but it was $2 a yard. I'm okay with that because it's got sheepies. Yeah, I may need to leave the house soonish. I'm almost out of chocolate. Oh, oh and, in case it matters to you, today is called Thursday. * No, the cat does not count.